With Valentine’s Day just around the corner everyone has love on the brain. I love making holidays fun so I was trying to think of special ways to show my family I love them. The truth is, us moms show our love in special ways all the time. Maybe not in ways that will end up on Pinterest or in a Facebook status but in the daily routine of a regular life. Love doesn’t always look like the fairy tale we imagine. It’s not always shiny and sparkly like the Valentine’s cards at the store but it’s every bit as beautiful. I am often reminded of love in times that catch me off guard, like while my 7-year old is home sick with the flu. Even though the lack of sleep has been tough on me and I feel like a less-than-average waitress covered in snot … I am so grateful to have a daughter to take care of. I was also reminded of deep love a couple of weeks ago when our 12 year old dog, Diesel died. The pain in my family’s heart was so strong, it could only be real love. Love comes in the little moments when I choose to listen to my 10-year old talk about things only important to a 10 year old. In my patience, I find those things become important to me too. Or when I choose not to complain when my husband has to leave town for business. In my support, I find I am proud of his hard work. Still, when you can shout out the love in a big, bold way.. I say go for it! 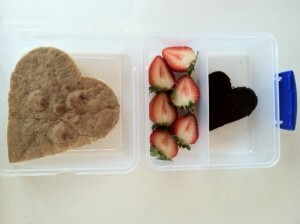 Leave a trail of construction paper hearts from their room to the breakfast table (your hubby might like that one too!) Or put red, white and pink balloons in their room so they see it when they wake up. Valentine’s day is on a Saturday this year so instead of putting a little note in their lunchbox at school why not serve up heart shaped sandwiches and treats like this. Make their favorite meal for dinner! Cooking is a great way to show your love. Remember, though family dinner time isn’t just important at the holidays. Eating together helps busy families stay connected. Make a special treat! Healthy food tells your family they are important, that you want them to be around a long time and live the life they want! Now, since it’s Valentine’s Day, chocolate is in order! Here are a few fun treats you can make that won’t leave them bloated and you feeling guilty. My 3 ingredient fudge can’t be beat. If you don’t have a lot of time, try my molten chocolate cake. That sounds like a really fancy recipe that would be hard to make, right? Nope! Throw it in the crock pot and it will be done when you need it! One of my family’s favorite treats is my love crunch! People tell me I should sell this stuff! One taste and you’ll know why (warning: you won’t make this just once! ) I recently showed the Charlotte Today crew how to make it on WCNC-TV. Take a walk after dinner: Don’t turn on the TV! Walk and talk instead!! A walk is a great way to get the conversation going. Plus, walking after meals aids in digestion and burns calories so it’s a win-win! Read a book together: There is something about just sitting and reading that makes quiet time with your child so special. 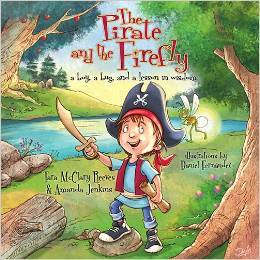 If you want a great gift for a child for Valentine’s Day, I recommend The Pirate and the Firefly by my friend Tara Reeves. It’s about a little boy, Oliver, who loves pretending to be a pirate, but learns that blindly following others doesn’t leave him with a good feeling inside. It’s based on Psalm 1:1-3. In the end, Oliver learns that following God’s way is the true way to wisdom! Showing your love doesn’t have to take a lot of money but it does take time and intention. There are going to be moments that are stressful, there’s no getting around it. Make sure you are finding healthy ways to deal with the stress so you can still appreciate it even when things get crazy (and a little germy). After all, we all want to feel loved! Whenever I need a little extra comforting and love.. I turn to the bible. Reading it brings me great joy and comfort. It is a gentle reminder of what love is. This is also the verse that I picked out with my husband over 11 years ago for our wedding day. Corinthians 13:4-8 Love is patient, love is kind. It does not envy, it does not boast, it is not proud. It does not dishonor others, it is not self-seeking, it is not easily angered, it keeps no record of wrongs. Love does not delight in evil but rejoices with the truth. It always protects, always trusts, always hopes, always perseveres. Love never fails. If you are needing some extra love this month.. I wanted to encourage you with these 25 verses on love.